I'm so glad you stopped by for the Creative Cuts and More Blog Hop. This month the Design Team is showcasing projects for Mom created with Creative Cuts and More Die Cuts. If you arrived from Jennifer's Blog (this month's Guest Designer) your in the right spot. If not, you can always return to the Die Cut Diva Blog to start at the beginning of the hop. I used the A2 Circle Window Die Cut in White for my card. Turning it on it's side, then added the beautiful sentiment from Our Daily Bread Designs Mom set in Black Archival, using a SAMJ for placement. On the inside I stamped the Floral Spray from this same set in Black Archival, then colored using the Pencil Over Marker Technique. Tied on a pretty Pink Satin Ribbon and added a pretty Pink Bow created with the Bow Easy. The second project I created uses the Square Bag #1 Mini cut from Acetate. Not only are these cute Square Bag Die Cuts great for Shower Favors, but they hold a Gift Card nicely too! I used the Flower Flourish from the Birds of a Feather Plate from Artistic Outpost, randomly stamping the images in Eggplant on Tissue Paper. The sentiment is from the ODBD Mom plate. I used Creative Inspirations Paint in Plum and an H20 Brush to die the White Satin Ribbon. Ohhh these are both beautiful! Love those images and how you colored them! TFS! These are just beautiful, I need to look into using them. Beautiful projects! 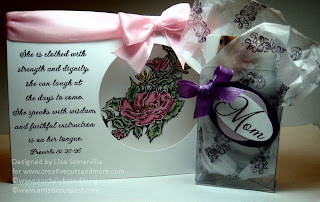 I love the pretty image and sentiment- love the acetate box and that ribbon that is painted looks gorgeous! Oh wow, Lisa!!!! This project is awesome!!! Love that pencil over marker technique! I'll definitely be trying that out!!!! Love the box too!!!! It's perfect! I love your card and the box Lisa! Very pretty! I like that little box. Very pretty projects.